The game stars Zeke and Julie, the characters from Zombies Ate My Neighbors, who must travel through five worlds to save their town from a horror exhibit come to life. The game has a host of monsters such as flesh-eating plants, ninja spirits, and ghosts that jump out of garbage cans. There is a wide range of weapons including plasma guns, plunger arrows, squirt guns, and various other tools to defeat your enemies. 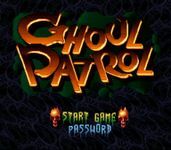 Source: Wikipedia, Ghoul Patrol , available under the CC-BY-SA License.